Dr. Revathi Naadimuthu, known affectionately as “Dr. Naadi” by her staff and patients, is a Board Certified Ophthalmologist and Corneal specialist. She graduated Phi Beta Kappa from Rutgers University being a member of the General Honors Program and the Golden Key Honor Society. She completed the highly esteemed 7-year BA/MD program through Rutgers University and UMDNJ-Robert Wood Johnson Medical School and stayed on to complete her Internal Medicine Internship at Robert Wood Johnson Hospital in New Brunswick, NJ. She then completed her Ophthalmology training at New York Medical College in Valhalla, NY. Dr. Naadi was trained in Cornea, Refractive Surgery, and External Disease at the University of Texas, Southwestern in Dallas, TX. She is a highly skilled surgeon performing complicated anterior segment surgery, cataract surgery with advanced technology lens implants, and refractive surgery such as LASIK and PRK. 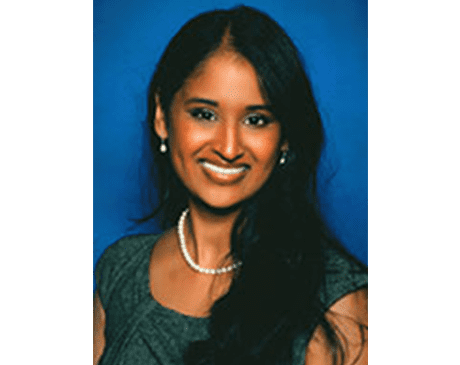 She is proficient in corneal procedures such as penetrating keratoplasty (corneal transplant), DSAEK (Descemet’s Stripping Automated Endothelial Keratoplasty), INTACS, and collagen cross-linking. Dr. Naadi gives educational lectures to her peers discussing the latest corneal techniques and surgeries. She has been given the Vitals.com Patient Choice Compassionate Doctor award, has been featured in Who’s Who, was named Top Doctor by NJ Top Docs, and has been elected to The Leading Physicians of the World. Dr. Naadi is on staff at CentraState Medical Center in Freehold, NJ and Ocean Medical Center in Brick, NJ. In her free time, Dr. Naadi enjoys spending time with her husband and three children. She enjoys crafting and DIY projects for her home.